With the success of our “Blocks in the East” game (BitE), it made sense to bring the system to capture battles on the “Western Front” too. 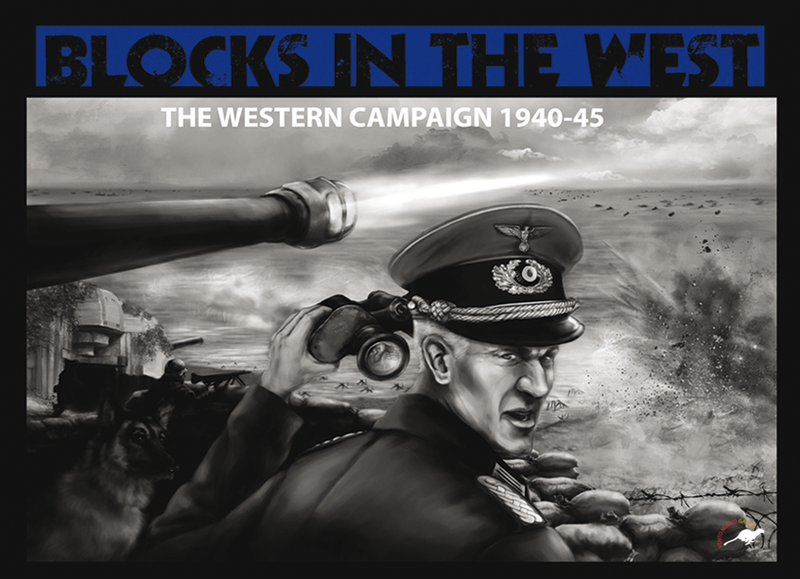 Blocks in the West (BitW) offers 10 scenarios that cover operations from 1940 France through the end of the war, including Italy, Normandy, and Bulge. 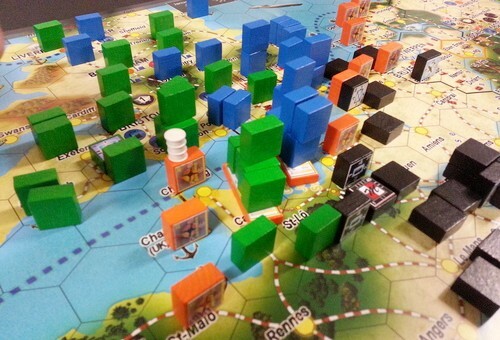 And, there is an 11th scenario you can play on the war’s end that combines West with Blocks in the East. 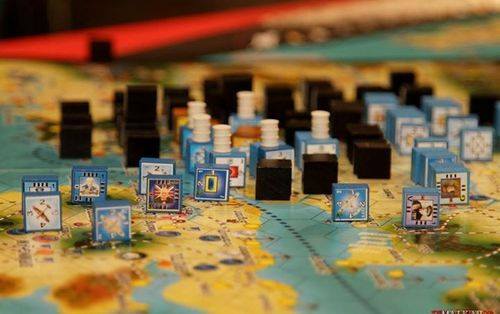 Blocks in the West offers different rules levels that allow players to dial up just how much complexity they want to use, and scenario times varying from a short 2 hours to 6 hours and up for the full campaign games. Precision-made blocks and colorful stickers are used to represent the major units involved and keep track of their strength or losses, providing a “fog of war” element that adds to the excitement. A hexagon is approximately 42 miles (72 km) across. A game turn is equal to 1 month of battles. A full strength block represents a major military formation (normally a corps) of about 30.000 men, 300 Tanks, or 300 planes - depending on the unit type, equipment, nationality, etc. 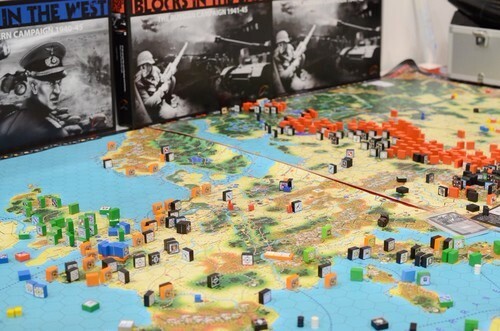 The game is recommended for two or four players: one/two control the Allied armies and the other one/two control Germany and the other Axis powers. While a challenge, due to size and “fog of war,” gamers report the game is also very interesting for solitaire play. With hundreds of wooden and plastic components a full laminated multicolor 125x87 cm mapboard, (made from two map sheets), Blocks in the West offers the scope and flexibility to study the wide variety of Western campaigns, from the wide open spaces in France to the tough slogging in Italy. With over 300 unit blocks and 300 different resource points of various colors, players can enjoy hours of fun with one of our scenarios. Each scenario has a different difficulty level, rated in brackets from 1 (Very Easy) to 10 (Very Hard). - BASIC GAME RULES: The first section introduces the basic concepts and allows players to start playing the game quickly, without too many rules to remember. The shorter scenarios are especially developed for these rules and to learn the game's mechanics. - ADVANCED GAME RULES: Provide more specific and detailed rules for an enhanced sense of realism and challenge, such as Fuel Consumption and Advanced Production. The long scenarios are richer when played with these rules. - OPTIONAL RULES: For those players who want to get the best out of the game, these additional rules can be added as desired. Pick some or all of them- you decide! They include Technology Research, Strategic Warfare with bombers, convoys, and submarines, Partisans, Amphibious Landings, Airborne Assaults, Special Attack Actions, and more! 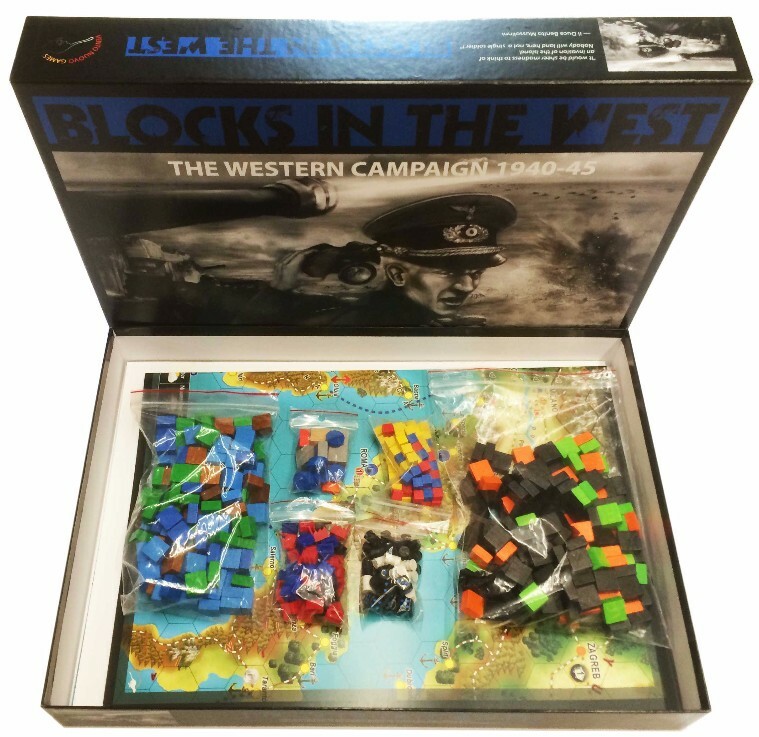 Blocks in the West is a complete game (and a heavy box loaded with good stuff!) all on its own. But we offer several additional items which can provide more fun or more convenience (or both!). Icon Stickers - While many players like simple “NATO” symbol stickers for their units, others prefer tank units to LOOK like ‘tanks,’ and infantry, ships, planes, etc. We offer a beautifully illustrated set of “Icon” stickers as an alternative. Some players use all of one set or while other players will pick and choose, perhaps leaving Infantry as NATO and putting icons for Tanks and Planes. The choice is yours! And, if players want full sets of both, we sell a complete set of extra wooden blocks! You can also find a short deck of 12 “information” cards, which capture special rules to use when certain events happen within the game. Note that these are not cards to “play” against the opponent but amount to placeholders to make it easier for players to remember that, since “X” has happened, certain changes to the rules are now in effect. We also offer a huge Goretex map (20% larger than the game’s original) which many players love for both looks and performance. This can be combined with a Goretex map for Blocks in the East to make a gigantic playing surface.